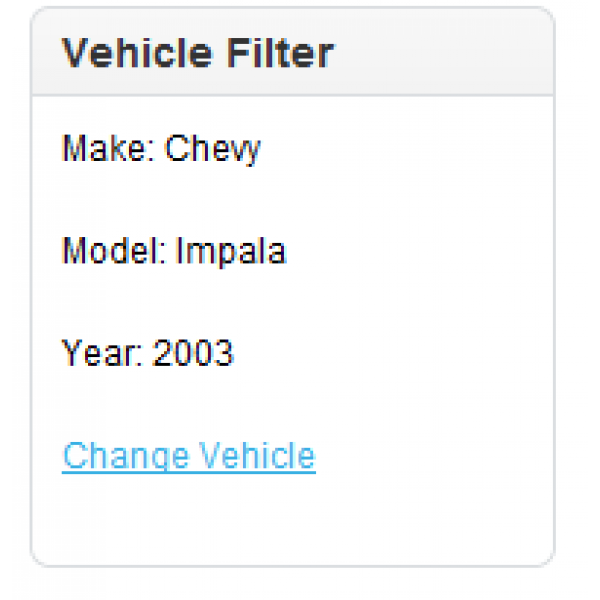 This is a vehicle year/make/model filter solution for opencart 1.5.1 and newer. Added version 2.7 with 1.5.5.1 compatibility. If you do not need the compatibility you would probably be better off sticking with the old version for now. I have tested the new version, but it's a large change to make it work with the new version and many places for bugs to creep in. I have not yet updated the multi-store version, but I will get to it soon. Added a multi-store version so that makes and models are limited to ones that are associated with products that are assigned to the current store. Only use this version if you need it as it will have some performance implications, though I hope they are minimal. This mod allows you to add unlimted year make and model combinations to your products. Unlike other year make model mods this is not a search mod. It is a filter mod. 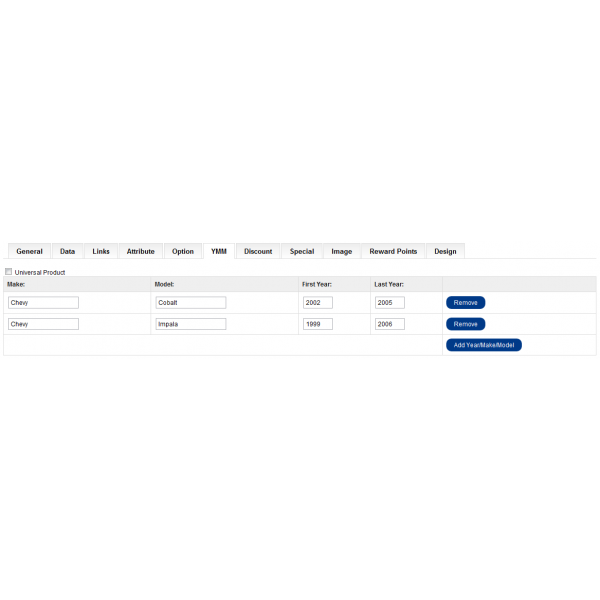 Once the customer selects a year make and model the entire site gets filtered by only the applicable products and categories. You can browse anywhere in the site and everything will be filtered. Not a search mod any browsing or searching done on the site once filter is set will be limited to applicable products. 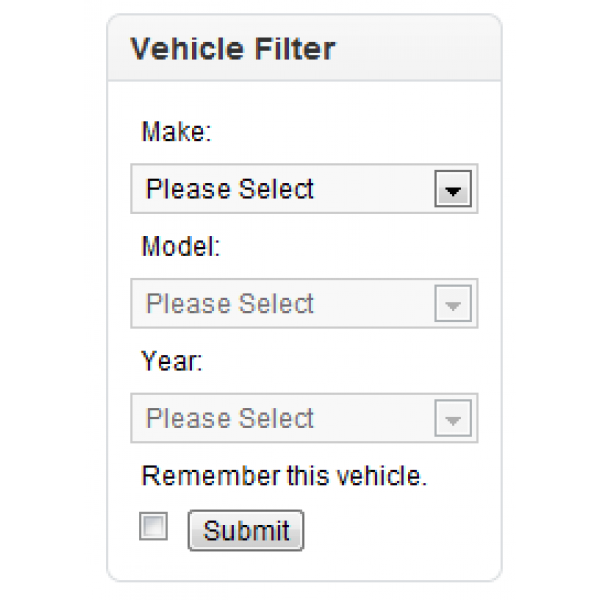 Option to remember vehicle which sets a cookie so that the user does not have to select vehicle every time they visit your site. Set products as universal so they show up no matter what filter is selected. 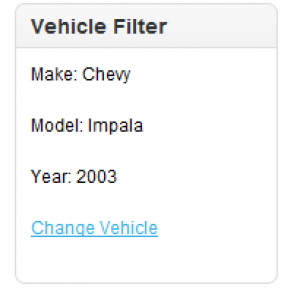 Adds a tab with a list of vehicles the product fits when applicable. 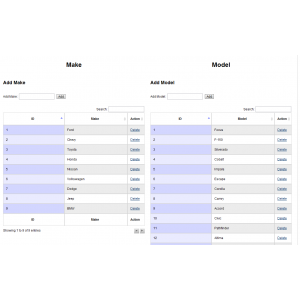 Includes import export script for easy adding of year make models to products. 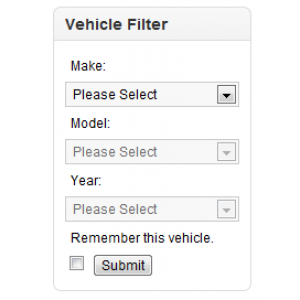 Filter by make only or make/model only etc. bug fix for slow queries when you have lots of filters. change so that home and search redirects should work with multi-store. Updated stylesheet so it will go horizontal if placed in one of the center positions. Added ability to import new data without deleting old data so you no longer have to import all data every time. Tweek styling for horizontal layout for when module used in center column. Fixed bug where search action was wrong with older versions of opencart. Changed vqmod template search to use wildcard so it should work with most third party templates without changes. 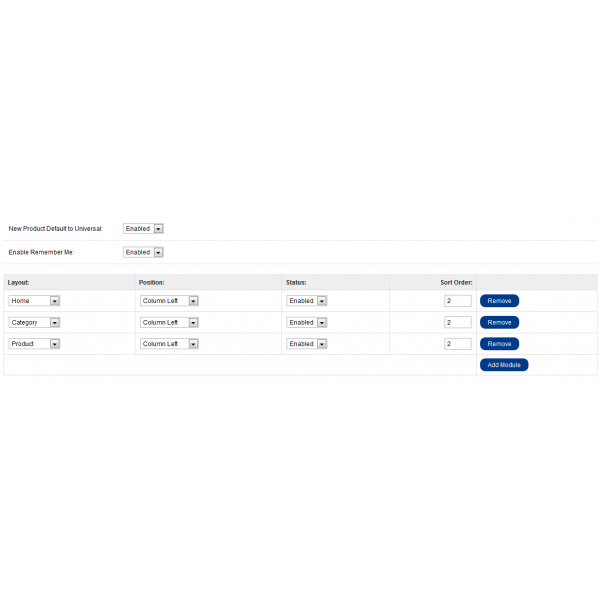 Move the destination selection into the modules so that you can have different destinations depending on route. Years are now filtered by engine if you have both enabled. Fixed bug where export did not 0 fill fields if engine was turned off. Changed the clear option on import to actually clear all tables so it starts clean. Added ability to export using alternate identifiers. Fixed a bug in the new engines filter years code. Fixed bug on non existent product pages. Refactored category filter. Should be much faster on stores with lots of products in a deep category structure. Added ability to sort years high to low or low to high. Fixed a bug where you could submit without selecting a make. Fixed a bug with alternate language support. Fixed bug if none of the products in a filter were assigned to any categories. Added sanity checks to the make/model/engine editor to not allow deleting if in use by products.